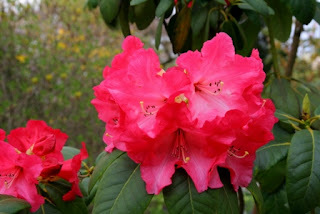 This year is going to be challenging as there are not many Rhododendrons in flower yet, it is a late season for some. A quick walk round the garden revealed Rh. macabeanum, Rh. irroratum, Rh Nestor, Rh. 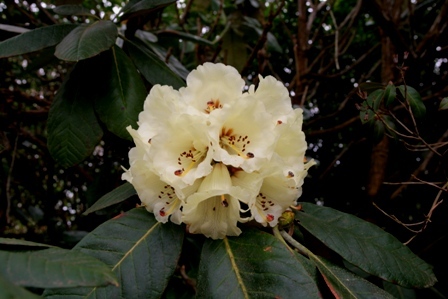 lutescens and Rh. Marie Curie. It is disappointing to have so few to show this year and it will be interesting to see how everyone else is faring. We are hoping for competition from Exbury, Savill Gardens, Isabella Plantation and some of the smaller gardens who always put on a good show. The competition is tough but it is fun taking part and a great opportunity to catch up on what everyone else is doing. year so a lot to live up to. similar to Rh. thomsonii, reddish and flaking. asset to the show bench. species and has made quite a large tree here. The large trusses are pale yellow and purple blotched and some forms are a very good yellow. It was introduced to this country by Frank Kingdom Ward from India in about 1928. It is flowering well this year although the good yellow form has yet to flower, unusual as it is usually in flower by now.